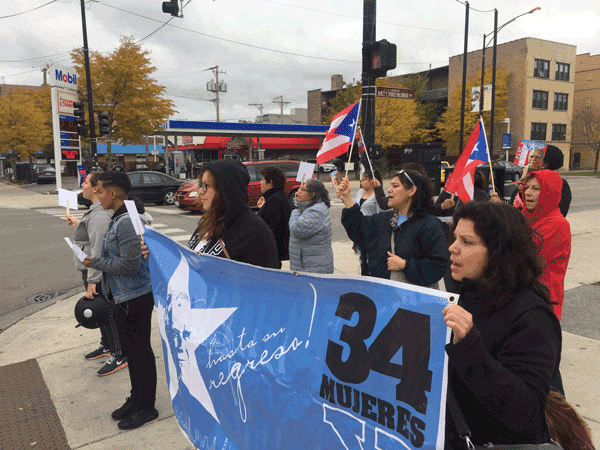 On Sunday October 30th, 2016 women from around the community and the Puerto Rican Cultural Center came to the corner of Division and California to demand for the release of Oscar Lopez Rivera. At 3:00pm, women began chanting “No Justice, No Peace, set Oscar Lopez free,” cars honked, children danced, and the women collectively shared a passion and a mission. With only two months left to capture the imagination of President Obama the women in Chicago continue to announce their presence in Humboldt Park, educating passers by. The Network’s goal is to mobilize 50 or more women on November 27, 2016 on the corner of Division and California, chanting and dancing for Oscar. If you are interested in participating in 35 Mujeres please email Jessie Fuentes, Coordinator of NBHRN at jessief@boricuahumanrights.org.